The Personal Development are challenging staff with another Christmas door competition. Doors should have a Christmas theme and incorporate recycled materials. The prize money will be split between the class charity and the winner. Judging will take place on Friday 18th December. Our school chaplain, Father Martin, has arranged Mass on Wednesday and Friday mornings at 8.30am as usual and for pupils whose buses arrive after morning mass, Fr Martin has also organised masses for Monday, Tuesday and Thursdays lunchtimes at 12.55. Staff and pupils are also making up parcels for gifts around our local community. Fr Martin Delaney will lead advent services over the coming two weeks for individual house groups. 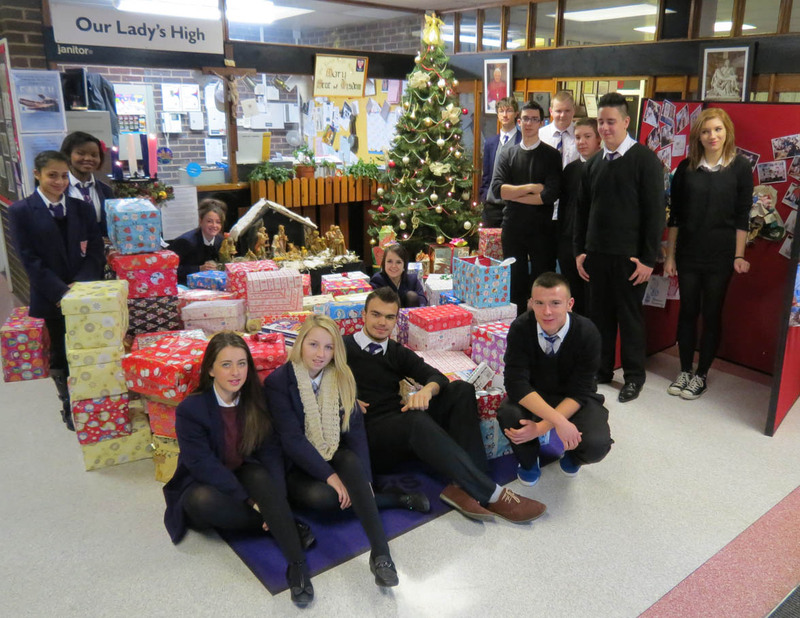 Meanwhile S1 RE classes will be trying to raise money over Advent to buy a present for Iraqi child refugees. The presents will be delivered to the camps in Iraq via the Aid to the Church in Need charity. Other RE classes are being asked to bring in non-perishable goods which will be made into food parcels by our Caritas class and shared across the local area. The S1 Nurture class hosted a Hallowe’en party party last wek. They made individual invitations for a friend, decorated the room and organised what they were having for eating and drinking. On the day, they played games, had some music organised by Mr Kerr and all in all, had a great time! They also cleaned up afterwards which was fantastic teamwork. Party held Monday 15th December 2014. Photos by Mr John Cairns. Tickets went on sale on Monday for the two Christmas dances. You may buy your ticket during interval and at lunchtime this week in the school’s main foyer. Tickets cost £3.00 each with crisps and juice included in the cost. Water and other confectionery will be available for purchases on the night. You must attend school on the day of the dance. The doors will close 15 minutes after the start time. Do not be late! Fourth to Sixth Year Wednesday 17th 7.30 – 10.00pm. The list, pulled together by Librarian, Mrs Macfadyen and English teacher, Mrs Jeffrey, could be seen as a bit controversial, after all isn’t Dr Who from Gallifrey? Is Shrek really Scottish? However, the main argument surrounded the fictional status of Greyfriars Bobby, with many pupils demanding he be removed from the list altogether. Many were also surprised that Dennis the Menace was included and learned about the variety of comics coming from Dundee. While Mrs Macfadyen argued valiantly for Professor McGonagall, threatening to ‘magic’ several more hands into existence, it was clear that what OLHS pupils appreciated most of all was humour, with Shrek winning by a landslide. More to the point, it gave everyone a chance to show off their impersonations of different characters, and find out about some Scottish fiction that they hadn’t known about before. In addition to the voting, pupils sat enthralled listening to Mrs Macfadyen telling Scottish folktales of Richard Canonbie and the Lee Penny. With the lights off and darkness outside, the atmosphere was certainly spooky! The annual Awards Ceremony was held on Thursday 2nd October in a packed games hall where over 300 pupils received their awards. The event was kicked off with a bagpipe solo of Highland Cathedral by Michael Clark followed by an opening prayer from our school chaplain, Fr Frank King. Our special guest, Mr James McVittie, OBE, was introduced by School Captain, Aaron Hawthorne. Mr McVittie, former head teacher of St Ninian’s High School in East Renfrewshire, spoke to the gathered audience about the buzz of working with young people and the importance of Catholic Education. He was a highly motivational speaker and both pupils and parents enjoyed his talk. The performing arts department were their usual magnificent selves, with a bagpipe solo of Highland Cathedral by Michael Clark, a rendition of Let the River Run by the choir and Highlights from Brave by the school concert band. Following the presentation of the awards, School Captain, Aimee Houston, gave the vote of thanks. Photographs of the award winners were on sale for £1 from the Art Department. If any parent or guardian still wishes to purchase a copy, their son or daughter should see Mrs Steinert. A very happy Christmas from everyone at OLHS! We’ve had a busy last few weeks of term as always with parties, celebrations and outings going on. Our Christmas concert was held on Thursday 12th December with contributions from various musical ensembles and our rather lovely staff choir. Upper school pupils performed a pantomime. On Monday, the 6th years welcomed pupils from Clydeview School to OLHS for a Christmas Party. 6th year have been fundraising since August to purchase party food and presents for the Clydeview pupils and everyone had a great time, especially when Santa dropped by! On Tuesday, we welcomed over 80 senior citizens for an afternoon tea party with entertainment courtesy of Performing Arts, particularly Aaron Hawthorne on the piano. Meanwhile, all the goods collected and parcelled and wrapped by pupils across the school through RE classes were dropped off to those in need throughout the local area. On Wednesday, there was a mass exodus of S1 pupils for the pantomime and on Thursday, S2 pupils headed for the wilds of Edinburgh for a trip around Holyroodhouse as part of their interdisciplinary work on Mary, Queen of Scots, with a wee visit to the Christmas market thrown in. Not forgetting two incredibly busy pupil ceilidhs, a staff night in, a Modern Languages Christmas card competition, and cinema trips for ESOL and the book group thrown in for good measure! In the middle of all the fun, National 5 assessments have been ongoing for our Performing Arts Faculty, and Father King arranged for priests from local parishes to come along for the Sacrament of Reconciliation. None of this would be possible without the generosity of parents and carers, or the hard work of the school staff, who give up so much of their free time. Thanks to everyone for their support over the last year. From everyone at Our Lady’s High School, we wish you all a very happy Christmas, and hopes for a peaceful 2014. Posted in 6th year, Celebrations, Pupil news	| Tagged Leavers Dance 2013	| Enter your password to view comments.